When should you use WP_Query vs query_posts() vs get_posts()? It seems like half the tutorials in the Codex and around the blogosphere use query_posts() and half use WP_Query. What's the deal? query_posts() is overly simplistic and a problematic way to modify the main query of a page by replacing it with new instance of the query. It is inefficient (re-runs SQL queries) and will outright fail in some circumstances (especially often when dealing with posts pagination). Any modern WP code should use more reliable methods, like making use of the pre_get_posts hook, for this purpose. TL;DR don't use query_posts() ever. get_posts() is very similar in usage and accepts the same arguments (with some nuances, like different defaults), but returns an array of posts, doesn't modify global variables and is safe to use anywhere. WP_Query is the class that powers both behind the scenes, but you can also create and work with your own instance of it. A bit more complex, fewer restrictions, also safe to use anywhere. query_posts - You should never ever use query_posts. Apart from what @Rarst has said, the really big issue with query_posts is, it breaks the main query object ( stored in $wp_query ). A lot of plugins and custom code relies on the main query object, so breaking the main query object means that you are breaking the functionalities of plugins and custom code. Just one such function is the all important pagination function, so if you break the main query, you break pagination. get_posts are faster than WP_Query. The margin depends on the amount of total posts of the site. The reason for this is, get_posts passes 'no_found_rows' => true by default to WP_Query which skips/legally breaks pagination. With 'no_found_rows' => true, WP_Query gets the amount of posts queried, then bails out, where by default, it further search for all posts matching the query in order to calculate pagination. 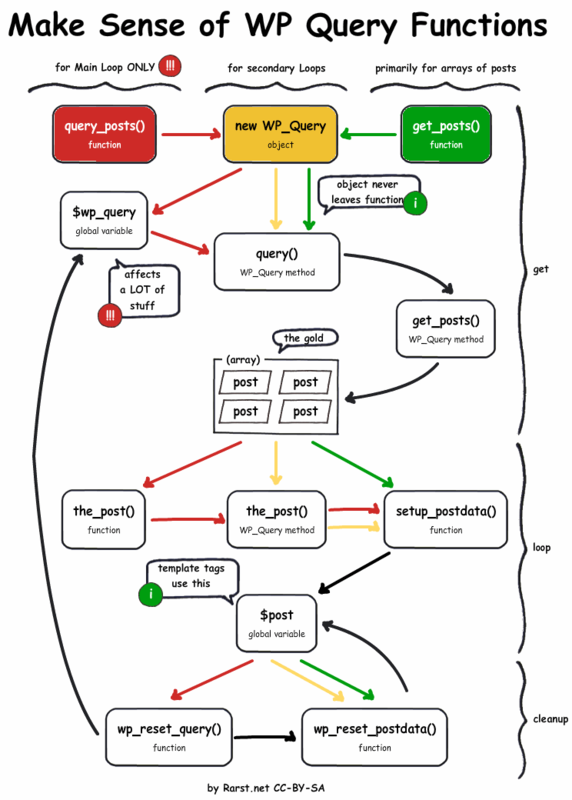 get_posts returns just the $posts property of WP_Query while WP_Query returns the complete object. This object is quite useful when it comes to conditionals, pagination and other useful info that can be used inside the loop. On the other hand, WP_Query is more of a general purpose tool, and is more like directly writing MySQL queries than query_posts() is. You can also use it anywhere (not just in the Loop) and it doesn't interfere with any currently running post queries. I tend to use WP_Query more often, as it happens. Really, it's going to come down to your specific case. There is simply no need to use query_posts(). All it does is instantiates a new WP_Query object and reassigns that new object to global wp_query. For reference, the following is that actual query_posts() function. Instantiate your own WP_Query object if you want to create an in depth custom query script. Or use get_posts() if all you need to do is some light manipulation here and there. In either case, I highly recommend doing yourself a favor and going to wp_includes/query.php and perusing the WP_Query class. Make sure that you use wp_reset_query() after using query_posts() because it will affect other query result also. If I recall reading right, essentially "the loop" is doing WP_Query in the core files, but in an easier to understand way. WP_Query: you can create and work with own object of it. Bit more complex, less restrictions, it is safe to use anywhere. I would say don't use get_posts() in a plugin. It imposes very restrictive filters in some cases (set's suppress_filters, ignore_sticky_posts, etc.) and should probably only be used in a theme when you want something done quick. Not the answer you're looking for? Browse other questions tagged wp-query query-posts query get-posts or ask your own question. Does wp_query and query_posts affect website performance? How to fix pagination for custom loops? Is there a flowchart for WordPress loading sequence? Is it necessary to use wp_reset_query() in a WP_Query call? How to display last 3 posts (recent posts) in a static page? Is it better practice to use query_posts, WP_Query, or get_posts to create various custom loops within a Page? What should I use, get_posts or wp_query for less CPU load? Use WP_Query or query_posts() or get_posts() for optimizing a site? Query_posts works when appending via AJAX call wp_query doesn't? When should you use wp_reset_postdata vs wp_reset_query?